Grapes are a great choice for the backyard garden because they can be enjoyed fresh, cooked in recipes, or processed as jams and jellies. 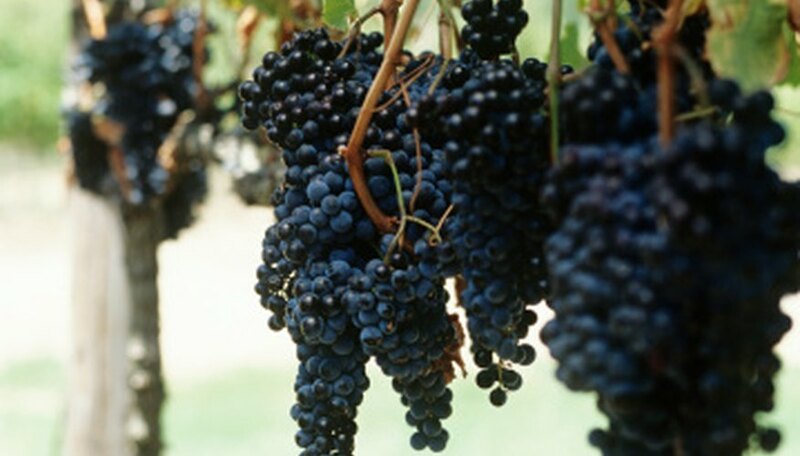 Well-tended grapevines can produce fruit for more than 40 years. While they tend to be low-maintenance, you may notice your grapevines aren't producing much fruit. Good fertilization and attention are needed to get grapevines to fruit. Without the proper nutrients, the grapes may not set properly, or you'll notice a small harvest. Collect a soil sample and get it tested. Cooperative extension offices and labs perform soil testing. Grape vines prefer slightly acidic soil with a pH between 5.5 and 6.5. The soil test will also indicate whether you need to add nutrients such as potassium or magnesium in the soil. Low potassium levels can cause discoloration of leaves or foliage death. A magnesium shortage can cause spots to appear on the leaves. Fertilize grape vines to get them to fruit. Begin one week after planting with an application of 8 oz. 10-10-10 fertilizer per plant. Spread the food at the base of each grape vine, keeping it 6 inches to 1 foot from the trunk. In the second year, spread 1 lb. of the fertilizer, and in the third and subsequent years, apply 1 1/2 lb. After that first year, wait until one month after growth starts in the spring to fertilize. Fertilizing too late causes too much grape vine to grow in the summer, leaving the plant susceptible to winter injury. Water grapevines frequently in the first few years of growth. The roots are not extensive and cannot find water well in dry soil. Water stress can cause poor fruit set and smaller grapes. Give your grapes water during dry spells, letting it soak in until the soil is moist. Use a drop irrigation system if possible. Prune to thin last season's growth. Long, straggly grapevines are often unproductive. Trim every other cane to different lengths to encourage the growth of new wood. Make one short, with just two buds. Make the next one longer with 10 to 15 buds. Continue alternating through the grape vine. Make clean cuts with sharp pruning shears. Do not make ragged cuts. They open the grape vine up to disease and pest infestation.